Click the small image at left to view product dimensions. Quantity discounts are available for 100 or more. Click here to contact us for details. The Ames Door Support prevents crushing of hollow metal doors when installing the lock. How can I make a baby gate more secure? How can I install a dog gate without damaging the wall? 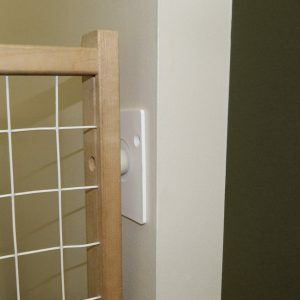 Use Our Baby Gate Wall Protector! The best baby gates should remain firmly in place even when they are pushed against by a baby, dog, or by a family pet. Most safety gates rely on the four rubber bumpers that press against the wall to keep the gates anchored in place. Unfortunately, that method is not always reliable. The bumpers rely on friction to keep the gate from moving. But if the friction is not great enough, or if the wall flexes outward slightly, the bumpers can slide and the baby gate can fall over. Our baby gate wall protector has a recessed pocket for the bumper to rest in to help prevent it from moving, providing an additional level of security. 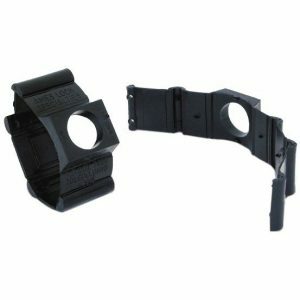 The wall protector has two mounting holes for attaching it to the wall with screws or wall anchors. Four wall protectors should be installed for safety gates that have four bumpers, one wall protector for each bumper. For doorways that are constructed with 2×4 wood studs, mount each wall protector with two #10 flat-head screws of sufficient length to penetrate the studs by at least 1/2 inch. 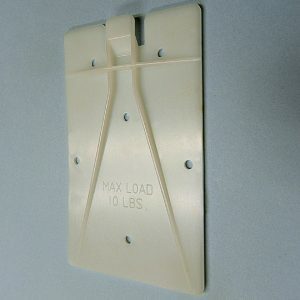 If mounting the wall protector on drywall where no wood studs are present, use #8-10 plastic wall anchors. This wall protector is also the perfect solution to protect the paint, wallcovering, or the drywall surrounding the shower. Simply install one on both walls at the end locations of the shower rod. The large surface area of the wall protector disperses the spring pressure of the shower rod to prevent any damage to the wall. Did you ever wonder how to fix the shower rod from falling? Each wall protector has a 1-1/2 inch diameter recessed pocket to help keep the shower rod from falling. 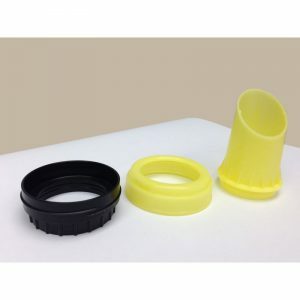 An additional quantity discount is available for 100 or more wall protectors. Click here to contact us for pricing. How to hang a picture? How to hang pictures on a wall without tools? How to hang pictures on paneling? How to hang pictures on drywall? How to hang pictures in a cubicle? How to hang a picture with wire? How to mount something on a wall without studs? How to hang pictures on shiplap? Looking for easy picture hanging solutions or the best picture hangers? Look no further. This picture hanger can be fastened to the wall with thumbtacks or push pins. Finally, there is an easy way to hang a picture instantly without using drills, nails, or hollow wall anchors. This push pin picture hanger can be attached to the wall in seconds. Simply hold it against the wall and insert push pins or thumbtacks through the six holes into the wall. Then hang your picture by inserting the picture wire onto the hook. For pictures without a pre-attached wire, simply attach a string or wire to the back of the picture with thumbtacks or staples. Great for hanging pictures on thin wall panels, drywall, basement wall paneling, and more. Provides an easy way to hang pictures in rooms that have thin paneled walls. 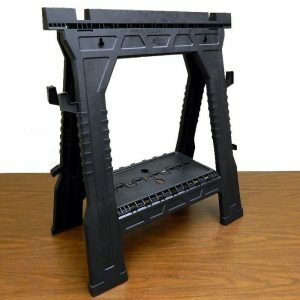 This picture hanger measures 3” wide by 4-15/16” tall and hangs pictures that weigh up to 10 pounds. Made in the USA. An additional quantity discount is available for 100 or more picture hangers. Click here to contact us for pricing. 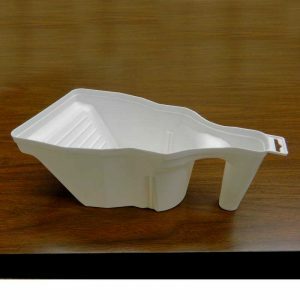 Our gallon can pour spouts are now available in two sizes. Model #PAUS will fit all containers that have a 1.30″ threaded diameter. Model #PAUS2 will fit all containers that have a 1.74″ threaded diameter. Our paint spatula wipes the paint that clings to the sides and bottom of a paint can, saving the paint that would otherwise be wasted. For cleaning one and five-gallon containers. To clean a quart size paint can, simply cut the blade to the correct length. 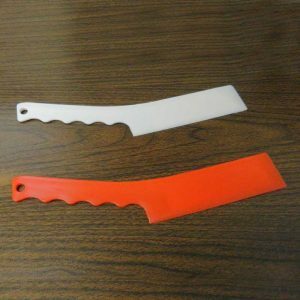 The paint spatula also may be used to stir the paint prior to painting. Made of heavy-duty polypropylene, this durable paint spatula will last for years. May be used with all water based, latex, or oil-based paints. When using water-based or latex paints, clean it with soap and water. When using oil-based paints, clean with mineral spirits (do not use turpentine). Supports up to 1,000 lbs. Our small paint tray is both right or left handed and is ergonomically designed to be held in your hand with less effort. Simply insert your open palm into the slot and rest your thumb on top. It hangs effortlessly on your hand without gripping or squeezing on the handle. 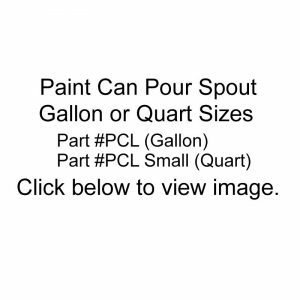 This small paint bucket holds more than one quart of paint. This small paint container can be used with either a paintbrush or with a small paint roller. To apply paint to the roller, simply roll it on the rear angled surface that has ridges that turn the roller to evenly distribute the paint on it. Fits all paint rollers up to 5 inches in length. The handy rear ledge is designed to hold the roller or a small brush between tasks. The paint tray has a slotted tab for easy storage on a hook or nail. 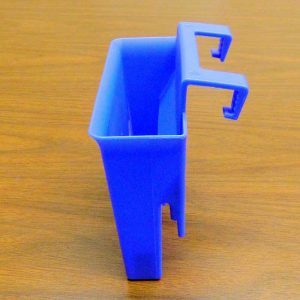 This small paint holder is both washable and reusable. Made of heavy-duty polypropylene, this durable paint tray will last for years. May be used with all water based, latex, or oil-based paints. When using water-based or latex paints, clean it with soap and water. When using oil-based paints, clean it with mineral spirits (do not use turpentine). Our plastic windshield tool is available in five different styles as shown. 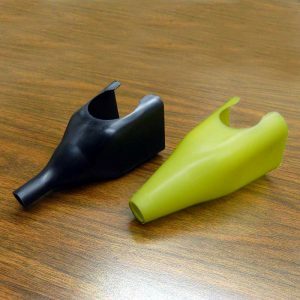 The tapered ends are an ideal windshield setting tool. Part #01 and #02 both have tapered ends, but #02 is slightly thicker. 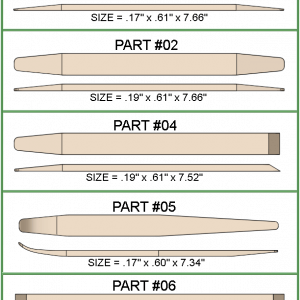 At the ends, the edge of the #02 is .06″ thick whereas the #01 is .04″ thick. Therefore the #02 is more robust while the #01 fits more easily into small gaps. Part #04 has one tapered end and one sharp chisel end. Part #5 has one tapered end and one curved end. Part #06 has two sharp chisel ends which makes it convenient when one end becomes dull and worn out. The chisel end is great for removing excess sealant or adhesive. The curved end fits easily into tight spaces, and it also functions as a pry tool without damaging the auto glass. Made of a specially formulated polymer, these windshield installation tools will not scratch, chip, or damage glass. A great addition to every toolbox, this tool has unlimited uses including windshield installation and removal, for prying on the glass, for tooling adhesives and sealants, for removing trim, and much more. Made in the USA at our factory in Ohio. This item is available with your custom logo or company name on it. A great way to advertise your company. Contact us for more details. This item is known by many names including fibre stick, fiberstick, fiber stick, windshield tool, windshield stick, windshield installation tool, plastic windshield tool, windshield bone tool, and universal tool. To buy, choose a model in the drop down box below and click the “Add to cart” button. Then click the “Checkout” button that appears at the top left.